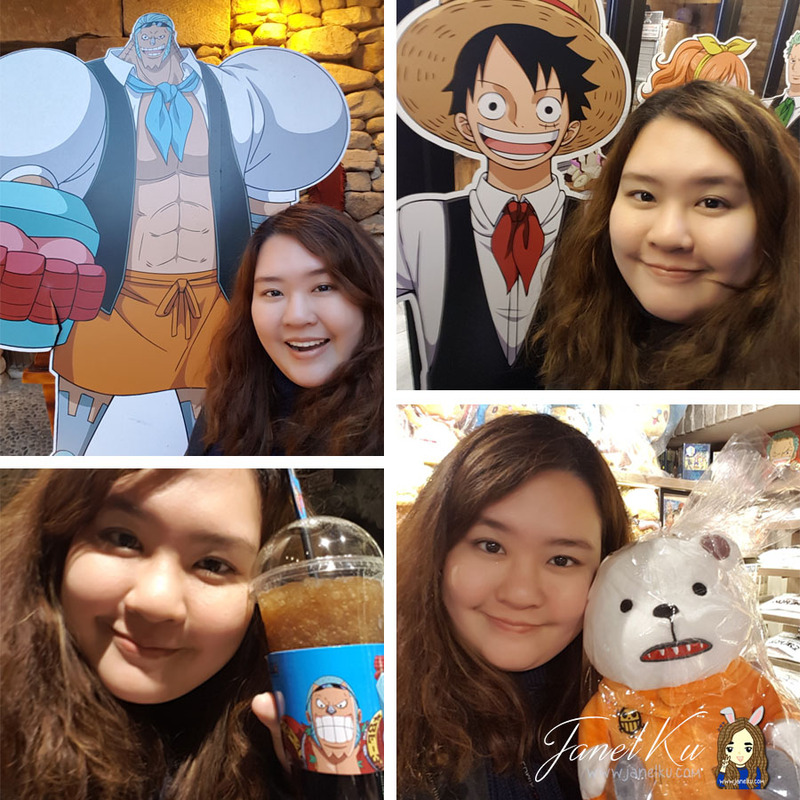 Visiting the One Piece Cafe in South Korea, Hongdae! Yes! All of you already know what a One Piece fan I am. 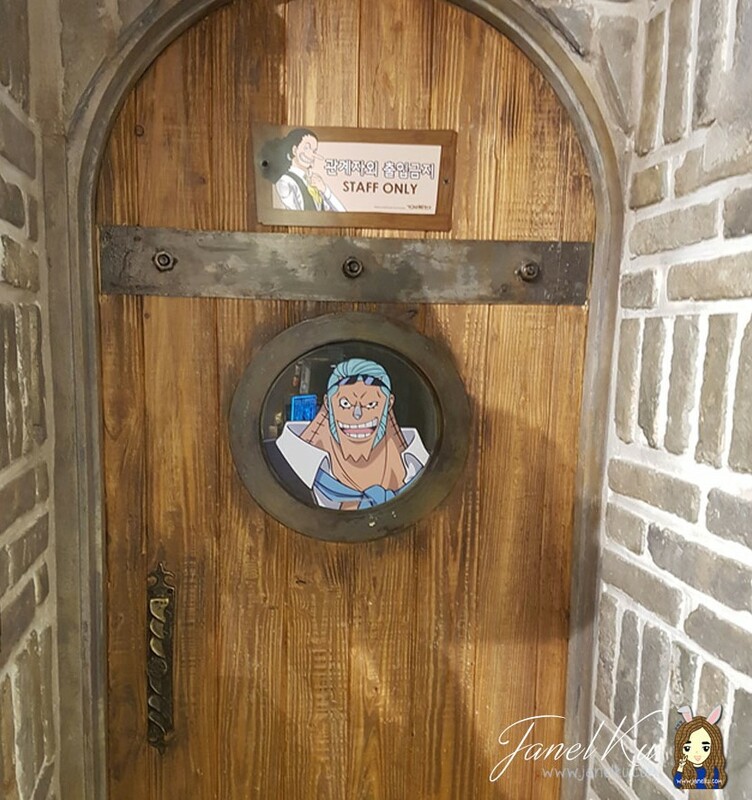 So here I am, at the newly opened Hongdae South Korea One Piece Cafe! The cafe opened late Dec 2016, and I'm super happy to visit this place (even when I fell prey to flu). So yes, I managed to check this place out on the 2nd last day of my trip, and I was super happy to head there with another fan. A majestic ship model is seen as you turn the corner. And you know you're in One Piece land. We head into the merchandise shop, located at level one. Note that the cafe is no where in sight, because it's at another entrance. Franky is put at the staff door to keep people away - like he was born for this. (For those who don't know - Franky is one of my favourite people in the manga, even though his popularity is not as high as the other characters) HAHA. MERCHANDISE GALORE! 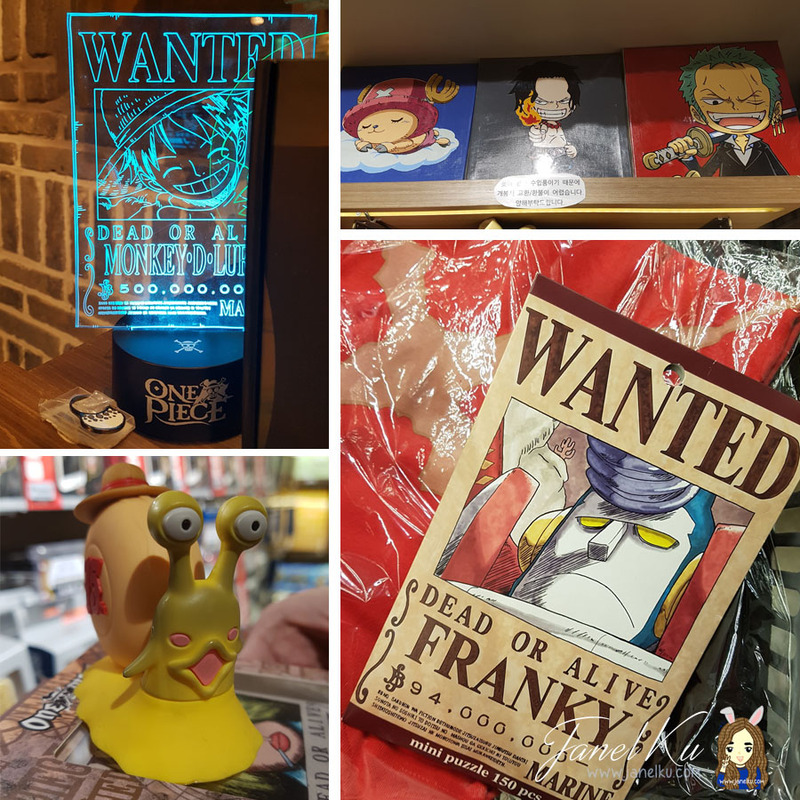 Every One Piece store in various countries will produce different merchandise specially for that respective country, so do keep an eye out for that. OMG the helmets are sooo cool. 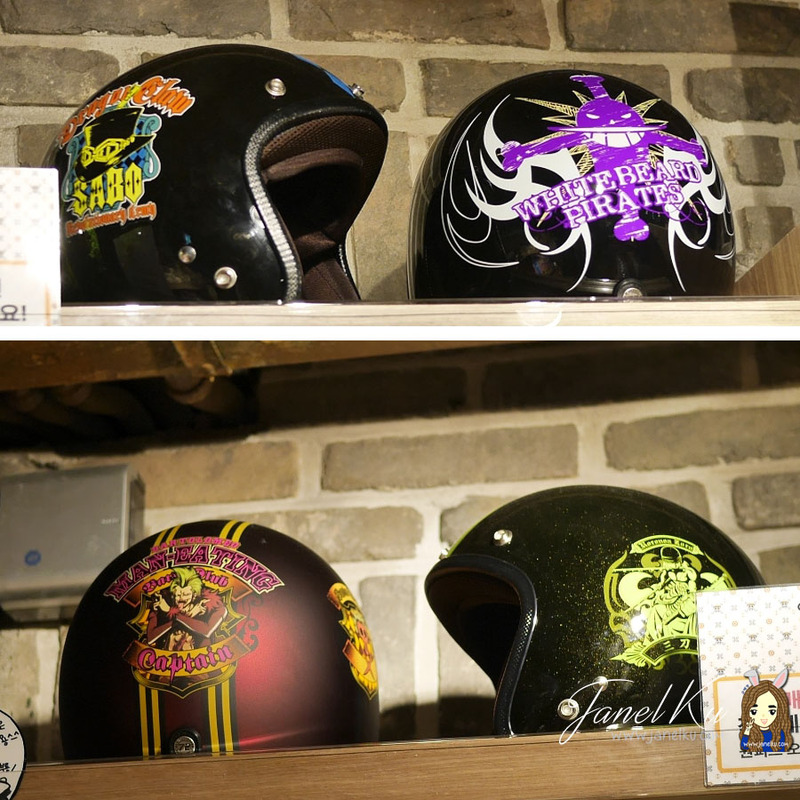 I want the WhiteBeard Pirates one, although I don't even own a motorcycle. And Korea - always must have skincare products. If you're a pirate sailing the seas, you better have Korean sunscreen. Also... Laboon soft toy! OMGOMGOMGOMG. I totally am regretting not getting it. South Korea's shop is thus far the only one I've seen a model sized den den mushi! Unfortunately it looks a little dirty - perhaps too many people have touched and gushed over it. Special to Korea - One Piece Wanted T-Money card (transport card)!This one is Sanji, but there are other characters available too. And of course, more selfies. After checking out the merchandise, we proceed to the cafe next door. When you enter, you'll see a counter and a staircase to your right. You cannot proceed upstairs to the cafe area unless you purchase something from the menu! And note - one person one order. If you don't order, you just don't get to go upstairs. I have to say that the menu is lacklustre in terms of its offerings compared to the ones I visited in Japan and Taiwan. Taiwan's menu is so much more attractive. Don't be shocked when I tell you that these devil fruits are indeed - cakes. Yes, full sized cakes that is slightly bigger than your palms. Unfortunately, another blogger who visited told me she bought it not knowing that it costed 40,000krw each (SGD$49.20!!) and inside was just some fondant and chocolate cake. Warning: It does not taste nice at all. Only instagrammable at most! Anyone wants a devil fruit macaron or some Chopper waffles? Upstairs is not a very huge space. 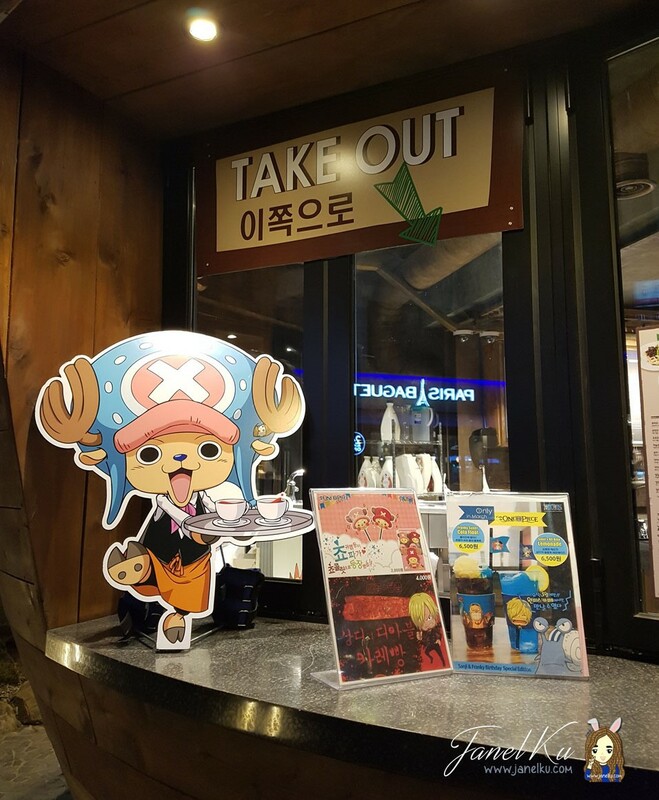 There's a free space you can chill out at, and feel free to help yourself to the Korean version of One Piece comic books. Also, do check out their display case of One Piece figurines. We only ordered 4 drinks (cos, 4 of us). If you guessed mine was the Franky one, you guessed right. And now - what do you think the Franky drink was? Anyhoo, there's our receipt. Each drink (a simple one even) costed about 6,000krw (SGD$7.30) already! If you are here for the experience, well and good. But don't expect too much from the food and drinks. In my opinion, it's actually one of the worst One Piece cafes I've been to. 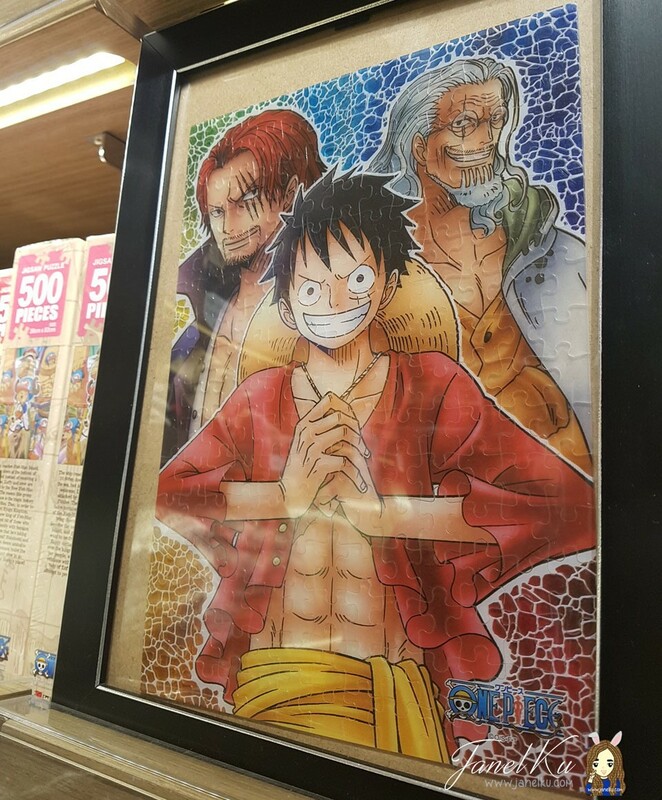 Check out my Taiwan One Piece experience here. 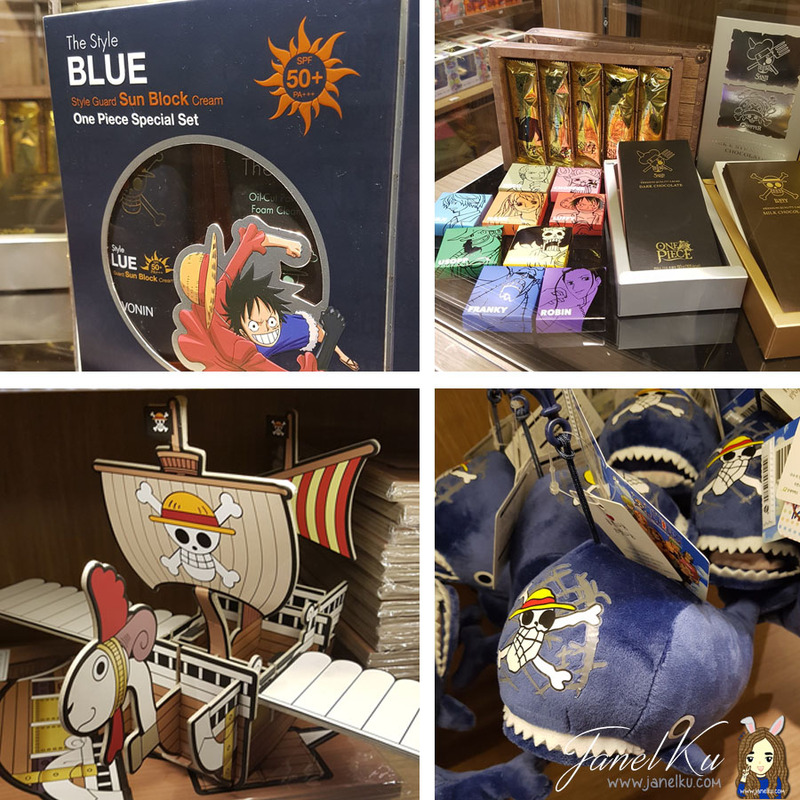 Check out my Japan One Piece Store Shopping experience here.